We've been busy uploading fabrics this week - firstly the Moda Jubilee quilt fabric range, 7 fabrics in classic blue prints from this collection by Bunny Hill Designs, making a great addition to our blues range as the colour blue seems so hard to come by recently! 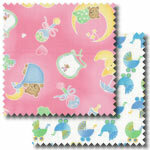 Secondly we have 5 fabrics and 2 panels from the Sleepy Time patchwork fabric range by Fabri-Quilt, a selection of cute nursery fabrics in pastel pinks and baby blues, featuring baby motifs such as bibs, teddy bears and rattles. The panels (one blue and one pink) are ideal for a quick new baby present, creating a lovely cot quilt, wallhanging or play mat easily. This month's Moda jelly roll and layer cake are also now available to buy, from the Lario range by 3 Sisters. Lario is an elegant and sophisticated range inspired by a recent trip to Lake Como, in rosy reds, aqua, petal pink and soft yellows, perfect for traditional quilts. Finally don't forget to check out our sale fabric page, where we have added all the remaining fabrics from the Cold Spring Dreams, Rose Cottage, Owl Be There, Morris Tapestry and many more, all at 20% off - pick up a bargain today!